Low prices. OrangeSmile.com offers car hire service in Egypt on the lowest-rate-guarantee basis, since we work with car suppliers directly. For your search criteria in Egypt, we always select and show the best rental offers. The car reservation process consists of 3 simple steps: (1) search for available cars for your dates in Egypt; (2) select your car type; and (3) fill in the booking forms. Once the reservation is completed, you will receive a confirmation voucher to your email address. During the booking process, please check your rental conditions. To pick up your car at the rental point in Egypt, you need to provide our confirmation voucher, your driving license and a valid credit card. The final payment is normally carried out at the pick-up point. Our car hire points in Egypt accept VISA, MasterCard, etc - please check your rental conditions. At the pick-up point, please read the handling manual and check the car for present defects. OrangeSmile.com wishes you a pleasant journey to Egypt! The car hire reservation system OrangeSmile.com allows renting a vehicle in Egypt within 10 minutes. Our largest database of car suppliers enables us to provide you a rental car in Egypt at the cheapest rate ever possible. At rental locations in Egypt we offer the following car sizes: mini, compact, economy, standard, premium and luxury. The following car types are available in Egypt: Sedan, Hatchback, Jeep, Cabriolet, Coupe, Minivan and Minibus. Pyramids have always been the main symbol of Egypt. There are more than a hundred of pyramids in the country. Giza is the location of the most famous landmark of Egypt – the Great Pyramid of Giza. The complex consists of three pyramids that are named after pharaohs Khafre, Cheops and Menkaure. These magnificent buildings are surrounded by tombs of other noble people – famous politicians, priests, pharaoh wives and other important figures of those days. The Great Sphinx of Giza is the most unusual statue in whole Egypt. The sphinx was made from a solid rock. Unfortunately, during its long history the statue was damaged during attacks of Mamlukes and Napoleon army. Nowadays, visitors can see an interesting laser show that takes place near the pyramids every evening. Saqqara necropolis is one more interesting archaeological site in Egypt. This place is famous for numerous temple ruins, some of which are several thousand years old, several pyramids and tombs. Saqqara is also the location of the Pyramid of Djoser, which is one of the oldest pyramids in Egypt. The beautiful Egyptian city of Memphis attracts travellers who come to see the statue of Ramesses II. The height of the statue is 20 metres. This unique statue is exhibited in a special pavilion; there is also a statue of a smaller sphinx (the Sphinx of Memphis) nearby. 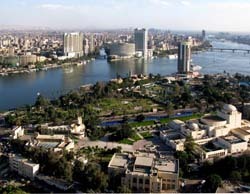 Cairo, the capital of the country, remains the most popular tourist destination. The city is rich in various places of interest and numerous museums. A visit to Cairo is also a great way to get acquainted with Egyptian culture. The list of most famous architect objects includes the Saladin Citadel of Cairo, Luxor temples and Al Azar University. When it comes to museums, the most famous and frequently visited one is the Museum of Egypt that exhibits large collections of archaeological and historical findings. The “newest” artefacts exhibited are at least two thousand years old. Fans of shopping will never be bored in Egypt as the city is home to the biggest market of the East - Khan el Khalili Bazaar. The total square of the market is 5 sq. km., and it’s possible to buy nearly everything there – from exotic fruit to magnificent jewellery. The Lighthouse of Alexandria is one more landmark of international level. The lighthouse was destroyed by an earthquake in the 14th century. One hundred years later a beautiful castle named the Citadel of Qaitbay was built on its site. The Valley of Mummies is one of most mysterious and unusual places in Egypt. It was discovered by archaeologists in 1997. The insurance deposit conditions in Egypt are individual for each vehicle. Therefore, on the search results page, you can select a car with lowest deposit required. Keep car keys in a safe place out of reach of burglars. In case of the car theft, your theft insurance will be invalid if there are no keys provided.